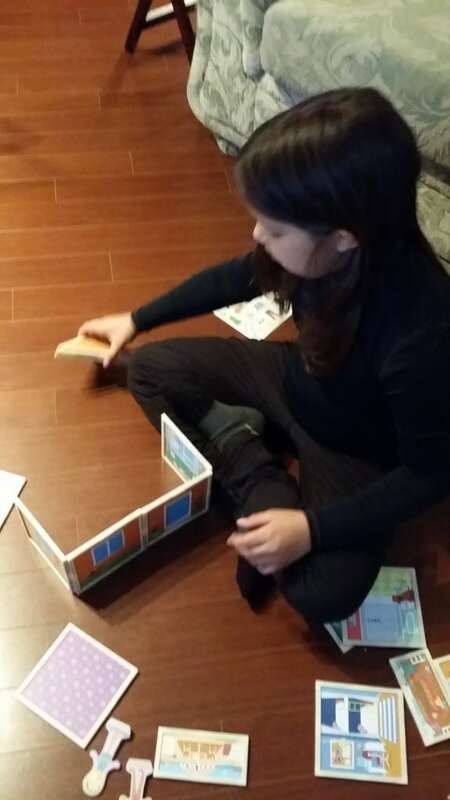 My Little One who is now 8 years old has always loved building things. She will sit on the floor for hours building and making structures out of whatever building toy she has at the time. I was pretty excited when I discovered the Build & Imagine building series that is aimed at girls. I knew as soon as I saw the sets, that my Little One would love them. Oakland, CA (September 16, 2015) – If she builds it, she will play … and add an important “A” for art to the vital fields of a STEM education (science, technology, engineering, and math). That’s the mission behind Build & Imagine, an empowering toy line for youngsters ages 4 and up that starts them on a road to innovation. Three magnetic construction sets such as Malia’s Beach House ($59.99) are packed with foundational STEAM learning yet are enchanting for endless hours of imaginative play. Since launching during Holiday 2014, there has been an enthusiastic response by youngsters (and parents). “It’s the pictures!” that makes these building sets so special. than 40 magnetic costumes and props. The illustrated details act as story starters, sparking imaginative play. Toy industry experts have taken notice including Dr. Toy, Parents’ Choice, The National Parenting Center, Mr. Dad and many others. This type of imaginative play “prepares little engineers for later reading and writing,” wrote Play On Words.com as they awarded their 2015 PAL Top 10 Language Learning Toys gold seal. That’s great news for a toy line geared to girls with its combination of construction and storytelling. Forbes describes how Build & Imagine engages both girls and boys by mashing up several beloved play patters, in their description of Marine Rescue Center ($49.99). “This toy combines the magic of magnetic tiles, the flexibility of traditional paper dolls, and most importantly, the fluid scene changes that speak to the magic of a storytelling theatre.” The article was entitled 10 Non-LEGO Toys That Make Better Builders. Perhaps for the first time, young girls get to brace walls at angles, test the front door and work together with siblings to secure the roof. Since all sets are interchangeable, children collect additional sets to build bigger towers or design a town. With each new set come endless storytelling possibilities. Dr. Toy awarded this house her “2015 Best Classic Toys” distinction for re-imagining the dollhouse as a building toy. Girls develop early engineering skills by designing a beach house for dolls Malia and Skyler. Decorate the 16 dual-sided StoryWall building panels and the dolls with more than 40 magnetic accessories. Features a swimming pool, functional door, living room, kitchen, 2 bedrooms and bathrooms, garden, floor and roof shapes, outfits, accessories, pets and more! Dolphins, seals and turtles, oh my! Kids assist Thea on her mission to save endangered sea animals by patrolling the coast for wounded wildlife and caring for the animals at the rescue center. This imaginative set includes 15 dualsided building panels, more than 30 magnetic accessories and a Thea doll. Features a dolphin pool, sea lion pool, operating room, laboratory, fish kitchen, ship control center, underwater observatory, otter rehab tank, rescue gear, jet ski, outfits, feeding supplies and lots of marine animals! workshop, beach gear, rescue gear, outfits and tools! When work is finished and the kitchen is cleaned, the dolls can catch a wave before heading home. This enticing set includes10 illustrated building panels plus more than 40 action packed magnetic accessories including Iggy the surfing dog. Kids can countdown to show time at this adorable theatre. Act out fairy tales or make up your own with this magnetic storytelling set. Choose from 8 stage backdrops and more than 50 magnetic props and costumes for endless imaginative play. The theatre is compatible with other Build & Imagine building and storytelling play-sets. Woof and meow! Raise money for the local animal shelter by creating portraits of the animals up for adoption. Build a studio using the illustrated magnetic panels, then dress the pets in crazy outfits and arrange wacky scenes for the dolls to capture with their camera or paintbrush. Kids develop foundational STEAM skills through play with this kit that appeals to animal lovers, artists and budding entrepreneurs. Amazon, The Grommet, Kohl’s, Fat Brain Toys and Zulily. Build & Imagine will be featured in upcoming catalogs such as Hammacher Schlemmer, Mindware and Museum Tour Toys. You might even tune in to QVC and catch their products in play. Browse inside Pottery Barn Kids or over 150 neighborhood toy shops. The magnetic building sets can also be conveniently purchased at Build & Imagine’s website: www.buildandimagine.com. So my Little One has Malia’s Beach House. Here she is totally engaged in building the beach house…. 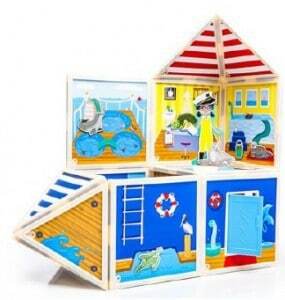 The beach house is easy to build and engages my Little One in imaginative play which I love. My Little One loved the designs, colors, and parts of the beach house set. The detail in all the rooms of the beach house and the exterior of the beach house are very well done. The beach house comes with characters that you can also dress with the numerous pieces that are included. As there are small parts, the beach house is not recommended for children under 4 years old. I recommend you check out the line of Build & Imagine toys. I love these type of products that keep my Little One engaged, building, learning, and in the midst of imaginative play. There is nothing better for me to witness than my Little One smiling, learning, and playing. Build & Imagine products are ones that will likely become classics, that have long lives as toys and passed down through generations.